As I explained earlier about For Each Loop Container, which process each file from selected folder. There is a requirement to save File name along with record, so later on we can identify which record comes from which file. Let me explain it how to achieve with FileNameColumnName property of Flat File Connection to get it easily. 1. Setup Flat File Connection with CSV file, as mentioned Basic Example of Data Flow Task. 4. Setup FileNameColumnName value with desired column name. Let's say "File Name". Congratulations, This column is added to output list with actual filename of that connection. Let me know your comments/questions. We have a requirements to execute Stored Procedure when SQL SERVER is started/restarted and we need to start some processes. I found that SQL SERVER provides a way to call Stored Procedure when SQL services are restarted. SQL SERVER provides this SP: "sp_procoption", which is auto executed every time when SQL SERVER service has been started. I found this SP and it helps me to figure it out the solution for the request as following way. @ProcName, should be Stored procedure name which should be executed when SQL SERVER is started. This stored procedure must be in "master" database. @OptionName, should be "startup" always. @OptionValue, this should be set up to execute this given sp or not. If it is "true/on", given sp will be execute every time when SQL SERVER is started. If it is "false/off", it will not. That's it, I hope this is very clear to use this feature. Microsoft Community Tech Days are in 11 cities in INDIA with 19 insightful Technical Sessions. These insightful Technical sessions are available in our city "Ahmedabad", Gujarat on 3rd October 2009. So book your calendar for this day and be a part of this TechDays. Let me know if you have any problem in registrations. We interviewed many people my company as recruitments are going on for developers. When I asked this SQL SERVER question to person "What is difference between DELETE and TRUNCATE in SQL SERVER?". 2. I can not use TRUNCATE command if foreign key is there on table. 3. TRUNCATE is faster than the DELETE, as DELETE write records them in Log file in case it is needed to rollback in future from LOG files. etc..
"DELETE can be rolled back while TRUNCATE can not be rolled back"
I asked them what does it mean?, give me an example. See what they say, if I have Transaction and if I have used DELETE then ROLLBACK will let them back to original state. In case of TRUNCATE within Transaction, will not allow me to original state. So, we found that we can found all values in the table. We can ROLLBACK the TRUNCATE command as same as other commands. This is place where most of the developers can not give accurate answer. I hope by this article they can have clear idea. Let me know if there is any confusion. If Transaction is done, means COMMITED, then we can not rollback TRUNCATE command, but we can still rollback DELETE command from LOG files, as DELETE write records them in Log file in case it is needed to rollback in future from LOG files. Today, I have one requirement to check dynamically if a node exists in my xml or NOT. I have a stored procedure that receives XML and I need to check if the message information xml contains one Node or NOT. If that node exists then I need to execute that Stored Procedure by different logic and if not it should run with different logic. I figure it out by using EXISTS. 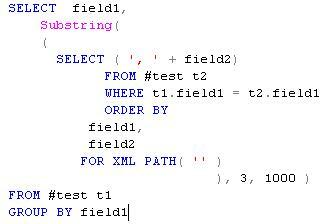 This is my XML, that I got as parameter. Now I need to check if "BulkData" node exists in XML, then I need to write different logic to get the result. This will return "1" if node is exists else return "0". That's it. I can write based on the return result by this statement. I don't need to execute trigger's code on some condition, like if it is called from particular stored procedure. If data is being updated from any other places, like application, or any other stored procedures, trigger code should be executed, but when one particular Stored Procedure is updating data to that table, it should not allow to do so. I search and I got the option CONTEXT_INFO with SQL SERVER. Let me share this with all of you. NOTE: We can use CONTEXT_INFO value in that session only. If there is new session we cannot use that value stored in CONTEXT_INFO. In this example, when we execute SP: TestA, it should allow to insert record in the table, while we execute SP: TestB, it should restrict. Here I set CONTEXT_INFO with SPName. I can use the same whatever is stored in CONTEXT_INFO during the current session. To make validation as defined above, lets create one trigger to restrict/allow user to proceed. In Trigger, as you can see, I again converted the SP name and compare it with CONTEXT_INFO. When Stored Procedure TestA is being executed, CONTEXT_INFO is not set, so trigger will not find comparison and allows user to insert record. As we have seen, How to generate Comma separated List in SQL. Today we know, how to get values from Comma separated column. Many times developers asked, How can I read comma separated values from variable? There are many ways to get solution for this. Lets discuss about the best way, I think so. We can use XML to read values from comma separated values. XML made our life easy. I have created one procedure which has one parameter VARCHAR(100). This procedure contains the parameter having value like '1,5,6,20'. The requirement is: Update the records having ID = 1,5,6,20 (Any of them). This is the one way that we can prepare the SQL query. So that’s it, Now I can easily use this result set in my query, to update the rows accordingly. So, it is very easy to read values from Comma separated value. Today, one developer asked me what is the difference between OpenQuery and OpenRowSet. Let me share this thing with all of you. While OpenRowSet has to specify all the connection options. So with OpenRowSet you can query to your remote SQL server from local. Let me know if it helps you in any way. Today, I came across requirement where I need to perform an action on all of the tables within a database. For example, How much space occupied by each table. I found undocumented Procedure: sp_MSforEachTable in the master database. The following script reports the space used and allocated for every table in the database. So, We can use sp_MSforeachtable procedure when we need to loop through each table. 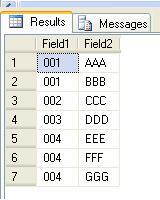 Today I have the following situation, where I need to display all related data in comma separated list. Till today we are using scalar function to display Comma separated list with select statement. That scalar function use the COALESCE() to make comma separated list. Today I found wonderful solution to display comma separated list without scalar function. Let see that.